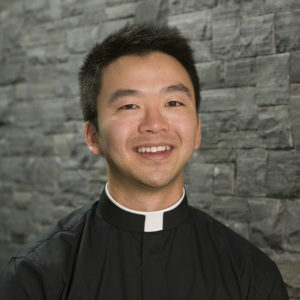 Deacon Troy Nguyen was born and raised in Calgary, AB and attended St. Vincent Liem Catholic Church as a child. He is also the oldest of five children and enjoys spending time with his family. He discerned the call to the priesthood beginning in Gr. 10 when he attended Seminary of Christ the King in Mission, BC. He eventually went to seminary in London, ON and Edmonton, AB. While he was taking some time off in between seminary to discern his vocation better, he worked at the bank as a financial advisor and got a teaching degree. Eventually, God called him back and he is happy to be a deacon for St. Peter’s parish and looking forward to his future priestly ordination.